Gulf Craft delivers Majesty 125 M/Y AltaVita to her owner in Europe. Gulf Craft has delivered the Majesty 125 superyacht M/Y AltaVita, the sixth in the series to be built and the third to be delivered in Europe. The sale took place in collaboration with Gulf Craft’s exclusive Australian distributor, Australian Superyachts, acting for the buyer. Set to cruise in the Mediterranean, this latest iteration of Majesty 125 for 2018 boasts a number of first-time design and personalisation features. Balanced by a striking bow, stylish triple decks and distinctive exterior, the superyacht features an excellent use of outdoor spaces with entertainment and lounging areas both fore and aft. AltaVita features a ‘walk-around upper deck’ for that extra level of comfort and privacy. 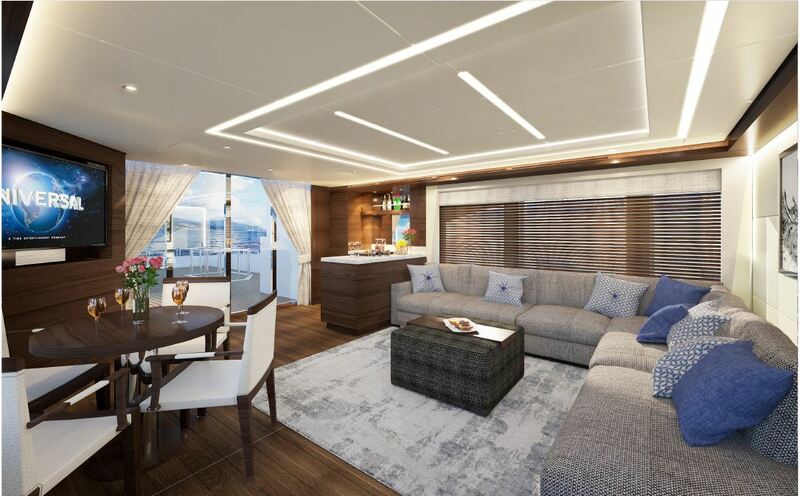 Majesty 125’s spacious sundeck features a curved wet bar and Jacuzzi along with a balcony on the side of the main saloon. 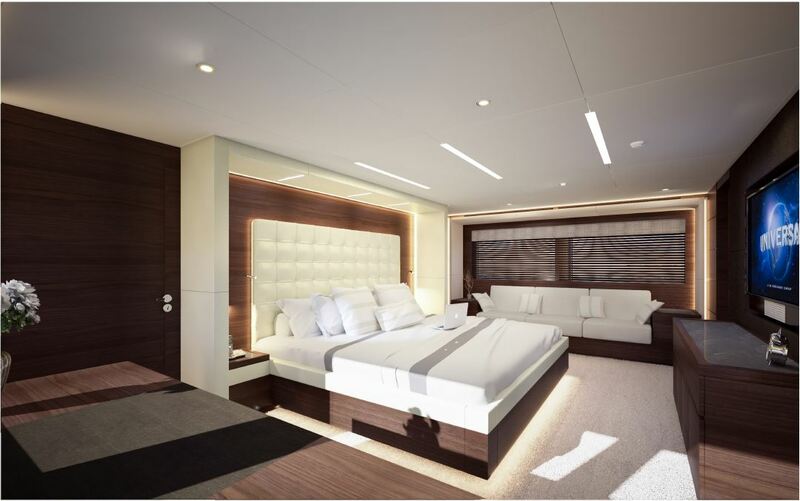 Moving to the lower deck, there a five stunning ensuite staterooms that can accommodate up to twelve people, richly finished in a dark stained natural walnut veneer with Satuatio White & Armani Grey marble and Italian leather. 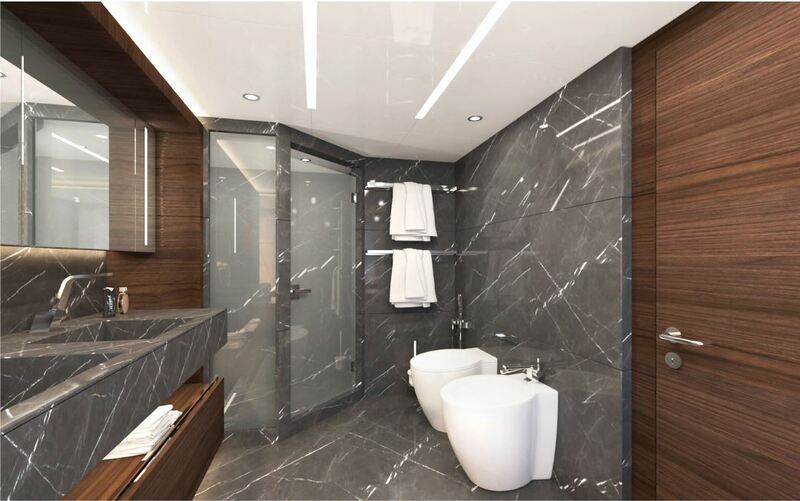 The owner’s stateroom in the forward main deck features a 55” Bang and Olufsen TV and an ensuite jacuzzi. This latest Majesty 125 is the first example in the model series to sport two unique geometric shaped guest cabin windows that add to the vessel’s futuristic look and offers uninterrupted views for the guests staying in the staterooms. AltaVita accommodates up to eight crew members in four cabins on the lower deck and a double captain’s cabin behind the wheelhouse. This powerful triple-deck is powered by twin CAT engines each having 1,925hp, giving her top speed of close to 20 knots. The Majesty 125 boasts a stern garage with hydraulic lifting door and crane for watersports equipment and a Castoldi Jet Tender 16 mounted on the swim platform for multiple runs ashore. “Owning a vessel of this exceptional standard opens up a unique ocean-going lifestyle with undisturbed privacy for the owners and their guests. As the unknown waters beckon, there’s only the blue horizon visible over the bow of the Majesty 125 offering imposing views. 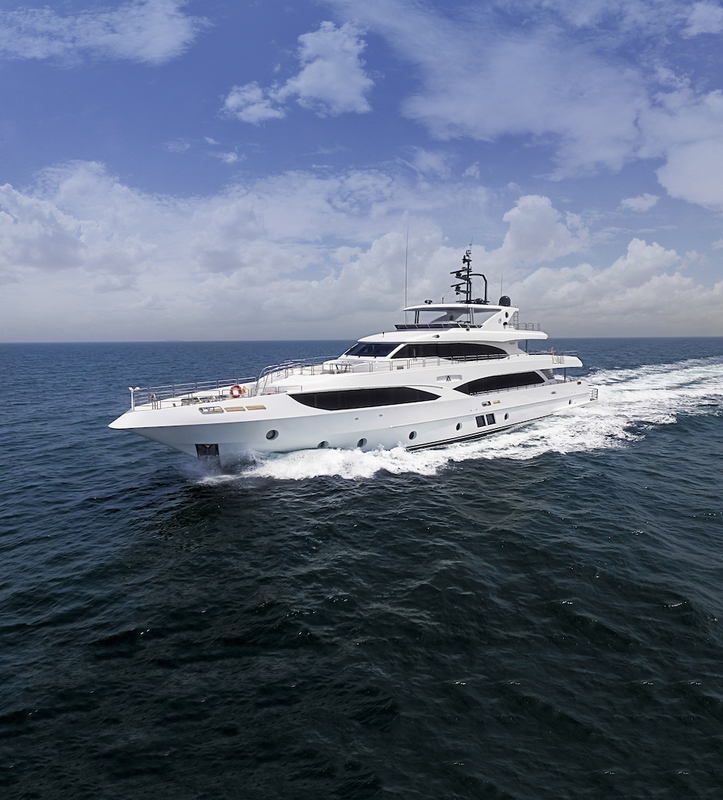 Designed to set a new benchmark, she has been customized to further enhance the owner’s experience.” added Notis Menelaou, Vice President of Sales at Gulf Craft. Certified by Bureau Veritas, the Majesty 125 is built under rigorous class inspection and complies with the UK Maritime and Coastguard Agency’s Large Commercial Yacht Code (LY3) & Australian Maritime Safety Authority’s National Standard for Commercial Vessels (NSCV) assuring the owners that their new superyacht is fully compliant for charter service in the main charter destinations in the world. Australian Superyachts’ Managing Director, Richard Morris added, “This fully Cayman Islands LY3 compliant Majesty 125 is perfectly suited to the global superyacht charter market, offering versatility for coastal cruising and extended Mediterranean adventures. Its spacious layout, optimised for 12 guests and 8 crew members, makes it perfect for private cruising for family and friends, and charter guests alike. The Majesty 125 includes technical features like Zero Speed Stabilisation, Fuel Purification System and a Fresh Water Treatment System. M/Y AltaVita will be under the spotlight at the Cannes Yachting Festival from 11 to 16 September 2018 and at Monaco Yacht Show, held from 26 to 29 September 2018.